← Major History Channel appearance coming in the not-too-distant future! 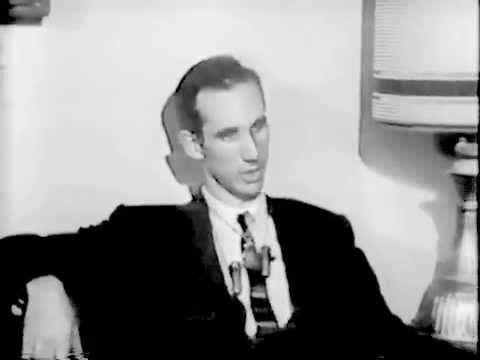 Per Secret Service Agent Floyd Boring: OSWALD IN D.C. 9/27/63 !! CLICK ON BELOW IMAGES TO GREATLY ENLARGE! Researcher Deb Galentine: “LHO supposedly arrived in Mexico City on 9/27/63. 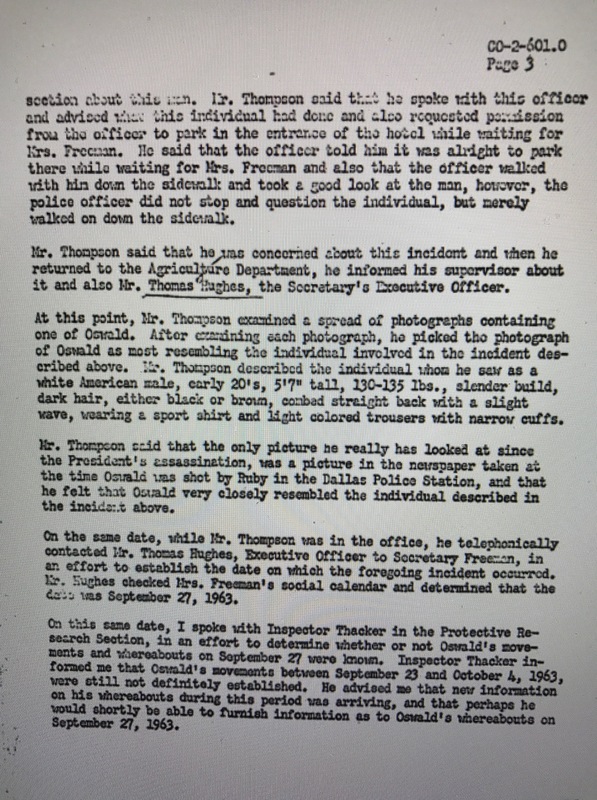 But this report has him in Washington DC on that date. I have doubts about Ruth traveling alone on her road trip with two small children. I suspect she took her husband along. So, it may be possible that Michael Paine stayed behind in the area. Someone in the D.C./PA/Baltimore area was impersonating LHO in several places during that time frame. Carolina Lynn: “This is intriguing on many levels. First, the witness is a chaffeur for Sec. of Ag. Orvill Freeman, a seemingly very credible witness. 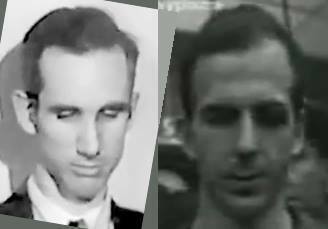 The driver spoke to a DC policemen about the demeanor of the “Oswald” look-alike he encountered. 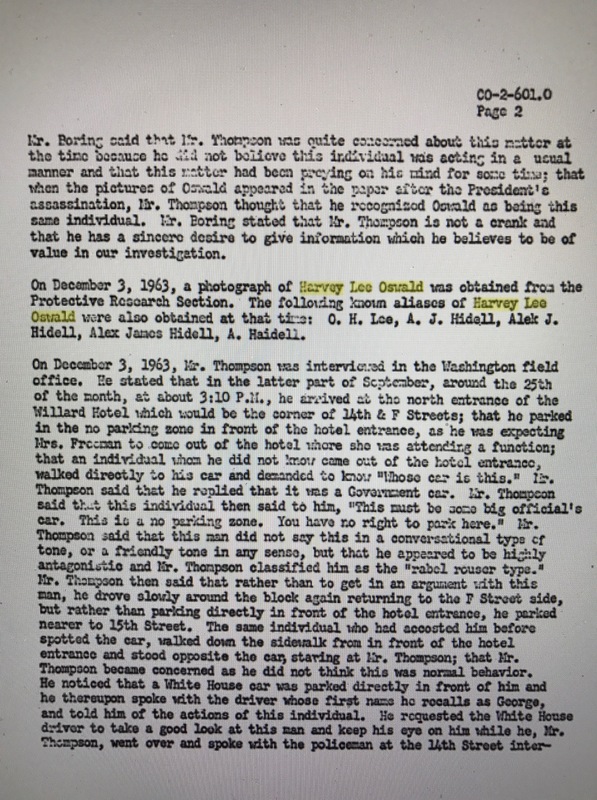 [Sadly, the report says the policeman did not interview or ID “Oswald”]…Second, the report throughout refers to the “suspect” as Harvey Lee Oswald”, a switching of the name that author John Armstrong believes is goverment code to indicate the Russian-native dobleganger of the New Orlean-born Lee Harvey Oswald… “Lee Harvey Oswald” had by the date of this report, Dec. 2, 1963, become the most notorious name in U.S. history, repeated over and over on TV and radio and in newspapers. 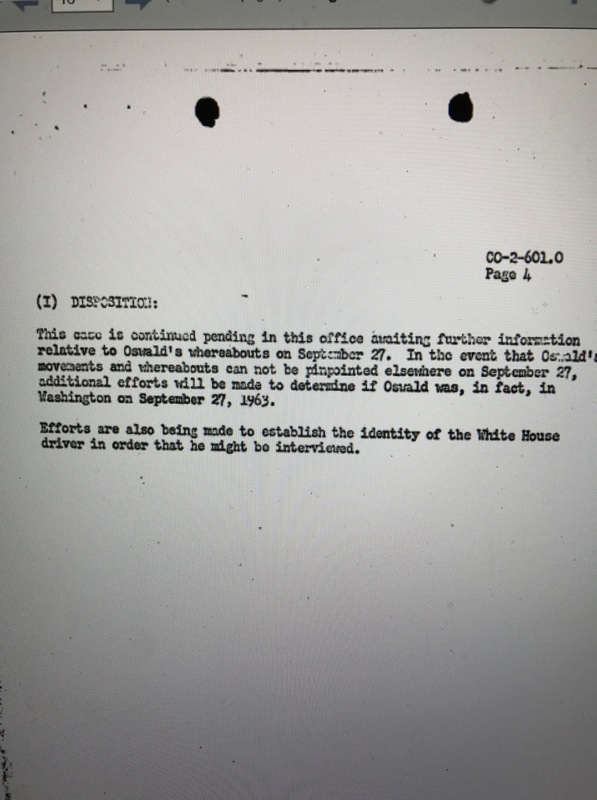 So it is hard to believe the name reversal could be “accidental”…Third, The Warren Omisson Report is adamant that “Oswald” was in Mexico City on September 27, 1963, the verified date of the DC incident, so this person was not the same “Oswald” in Mexico !!! 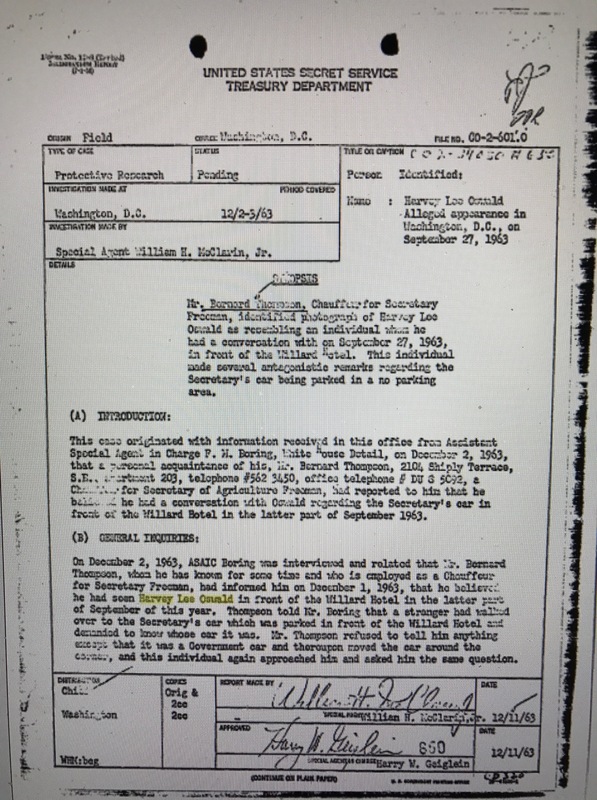 3 Responses to Per Secret Service Agent Floyd Boring: OSWALD IN D.C. 9/27/63 !! Please add me to your mailing list. Thanks.